With the economy as bad as it is, everyone is looking for ways to save on cash. While you will probably still have to do some Christmas shopping (and we encourage you to shop handmade when you do! ), not all your presents have to put in a dent in your wallet. Below you’ll find a short list of easy and fun holiday gift projects you can create without leaving the comfort of your own home. * Cook Something up in the Kitchen! If you feel most comfortable in the kitchen, you might ponder baking a festive holiday dish for your friends and family. Christmas candies and treats are always well received, whether they’re tasty stocking stuffers or just a little something sweet to munch on while gathered around the tree. Try cooking up peppermint bark or cookies and giving them to family members, friends, or co-workers. You’ll be surprised how far one batch of cookies will go! Or if baking isn’t your area of expertise, you might try packaging ingredients in colorful jars and distributing them as gifts! * Dazzle with Photos and Experiences! For the more visually inspired crafters, consider putting together a family photo album or cook book. These make for a special kind of present, since they contain shared experiences and memories. You can also try putting together a scrapbook, highlighting a recent trip or occasion you shared with loved ones. *Get Your Holiday Craftiness Going! 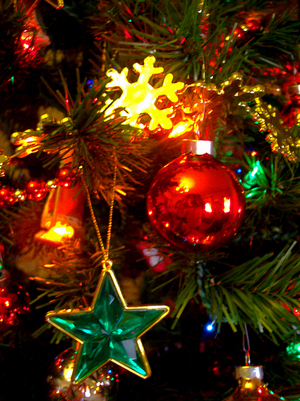 Tree decorations make for a great Christmas gift, plus they can be a lot of fun to make! You can put together ornaments out of old craft supplies or items you have laying around the house like beads, buttons, fabric, salt dough, even old light bulbs! Have some fun and make different decorations for everyone, maybe even matching them to that person’s personality. Or if you’re feeling especially artistic, craft ornaments that look like the gift receiver! *Light Their Fire with a traditional Handmade Gift! If you enjoy working with your hands, you might want to try making festive candles as gifts this season. If you haven’t made candles by hand before, purchase an inexpensive kit from your neighborhood craft store. Kits usually render a bunch of candles, so just a coupe kits can easily make enough candle gifts for everyone! Add embellishments to your presents to make them festive and unique. Mold your candle into a fun shape, paint on holiday patterns, or mix crushed flowers into your wax before letting it cool. I hope this list helps, have a safe and merry holiday and remember to always shop handmade to support local artisans!